A fabulous comedy show in a one of a kind venue! 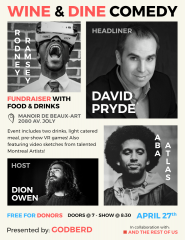 The Wine & Dine Comedy show has curated a lineup of top-notch comedians ready to give you a gut-busting good time at the renowned Manoir de Beaux-Art. Great event for single folk, dates and groups of friends. Plenty of time to hang out and socialize before the show, so don’t miss out!